It was a kind of magic: three times Gold for Al Zobair, all three sired by their eight years old sire SMA Magic One: Junior Champion Filly Aajilah Al Zobair, Junior Champion Colt Edwan Al Zobair, and Senior Champion Stallion Barjass Al Zobair. Well, maybe it was not all magic but wise horse breeding by HE Sheikh Abdulla bin Mohammed Ali Al Thani and his exceptional team. Furthermore, although it is certainly a magical aura that surrounds SMA Magic One, his potential as a sire is no matter of coincidence being by Psytadel (Padron Psyche) out of Majidah Bint Pacha, who is linebred to outstanding producing Saskia RJ. Al Zobair Stud celebrated three more Silver winners: Silver Champion Yearling Fillies with Nahhaba Al Zobair, sired by Cavalli and out of reigning World Gold Champion Senior Mare Tehama Ballalina, and Silver Champion Senior Mare with the Eden C daughter Najdiya Al Zobair out of wonderful Najdah Al Zobair. Last but not least, the Silver Champion Yearling Colt Fakhr Al Zobair, by Cavalli out of the SMA Magic One daughter Ammoriah Al Zobair. What a great success for this farm early in the year. For four days the Ajman Arabian Horse Club opened its doors to welcome the Ajman Arabian Horse Show hosted by HH Sheikh Amaar Bin Humaid Al Nuaimi, the first exhibition of Arabian horses in the UAE in 2018; and many more exciting events throw their long shadows ahead. Thanks to the show schedule the most beautiful Arabian horses competed for the prestigious title of Ajman Champion with the night sky as the backdrop. In the spotlight also was Unanimous Gold Champion Yearling Colt Saddad Albidayer, an upcoming star of Al Bidayer Stud, proudly owned by Sheikh Mohammed bin Saud Al Qasimi. The light grey Saddad Albidayer is by E.S. Sarab (by Marajj) out of DL Marielle (by Marwan Al Shaqab), so linebred to Marwan Al Shaqab and traces back to another outstanding producer, the mare RGA Kouress. She is also the dam of E.S. Sarab’s sire Marajj. Fakhr Al Zobair went away with Silver and the FA El Rasheem son Bezyan Al Bustan received the Bronze medal. The Unanimous Gold Champion Yearling Filly achieved D Rannanah, by D Khattaf by Royal Colours and out of a Marwan Al Shaqab daughter. D Rannanah’s dam is Jumilla, a paternal Versace granddaughter and tracing back to famous Aliha, an English-Egyptian-cross bred by the Maxwell family. As already stated, Nahhaba Al Zobair achieved Silver Champion Yearling Filly and Bronze was given to Al Aryam Samha, by Kahil Al Shaqab. Bested only by Gold Champion Junior Filly Aajilah Al Zobair, the Kanz Albidayer daughter Kareemah Albidayer out of Khaleifa achieved Silver Champion Junior Filly. The 2017 Gold Champion Yearling Filly D Mumayyazah, by FA El Rasheem received Bronze this time for her breeder Dubai Arabian Horse Stud. Dubai Arabian Horse Stud won another Bronze medal with D Mumayyazah’s paternal half-brother D Ibn Rasheem in the Junior Colts competition. The Shanghai EA son KA Nabras out of AJ Nazwa was awarded Silver Champion Junior Colt, bested only by Edwan Al Zobair, mentioned before. Marwan Al Shaqab was the dominating sire in the Senior Mares Championship. He can be found in the pedigree of Gold Champion Senior Mare Al Aryam Hamra, by Marajj. Al Aryam Hamra already won the Ajman Gold Champion Junior Filly in 2015 and came back to compete in the senior division. Born in the truly hidden paradise of Al Aryam Island, owned by HH Sheikh Hamdan Bin Zayed Al Nahyan, Al Aryam Hamra is out of the Emiliusz daughter Al Aryam Hanna, herself 2015 Abu Dhabi National Gold Champion Senior Mare, who continues the precious line of SF Hosanna. SF Hosanna offered Egyptian lines in combination with Khemosabi and Spanish blood but sadly passed away too early. 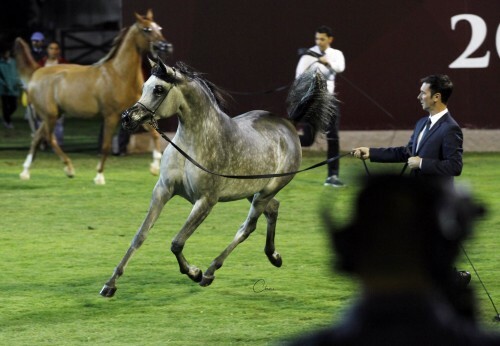 Silver Champion Senior Mare went to aforementioned Najdiya Al Zobair while the Bronze medal was given to Asela Al Kindi, by the Marwan Al Shaqab son Marhaabah. While Barjass Al Zobair trotted away with Gold Champion Senior Stallion, the Silver medal went to Omear Al Hawajer. Dr. Ghanem Mohamed Obaid AlHajri is the proud breeder and owner of this Silver Champion Senior Stallion by Sh-Hab Al Hawajer (by Marajj). Bronze went to Albidayer Stud’s Masroor Albidayer, by AJ Dinar. It was an impressive show with an exciting atmosphere. Thank you to the organizing team of Emirates Arabian Horse Society, especially to Mr. Essam Abdulla and his team, for arranging everything so elegant and smooth. Arabian Horse Global Network would like to extend our thanks for the excellent collaboration. Another heartfelt thanks go to Claire Reigneaud and Albidayer Stud for making the photo coverage possible.